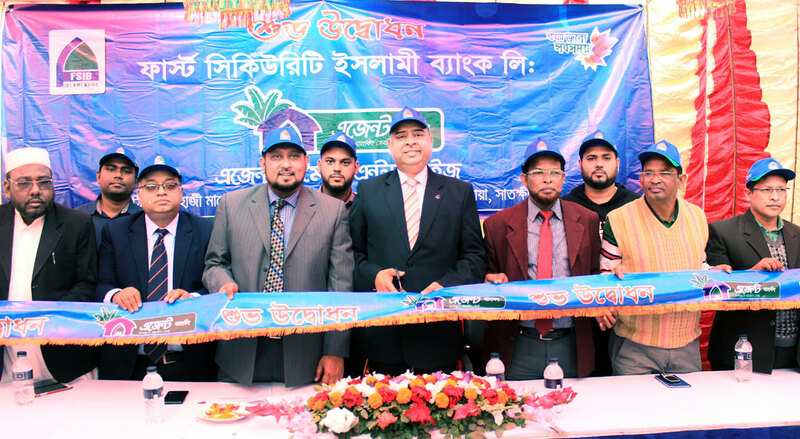 Agent Banking Outlet of First Security Islami Bank Ltd. has started its operation on January 15, 2019 at Bamonkhali Bazar, Kalaroa, Satkhira. Mr. Syed Waseque Md Ali, Managing Director of First Security Islami Bank Limited inaugurated the Agent Banking outlet with the massive presence of the social elites and locals. Among others, Mr. Md. Mustafa Khair, Deputy Managing Director, Mr. Md. Abdur Rashid, Khulna Zonal Head, Mr. Ali Nahid Khan, Head of Alternative Delivery Channel Division, Mr. Md. Faridur Rahman Jalal, VP of Agent Banking & Mobile Banking, Mr. Arafat Hossen, Upozila Vice Charman, Mr. Aminul Islam Laltu, Former Upozila Vice Chairman, Mr. Moniruzzaman Bulbul, Acting Mayor of Kalaroa Pourasava, Mr. Muhammad Monirul Islam, Manager, Kalaroa Branch, First Security Islami Bank Ltd., Proprietor of Agent Moitry Enterprise and other elites were present on the occasion. A Doa Mehfil was also performed on the occasion.